Fitting helmets on infants or smaller-headed toddlers is very hard to do with commonly available helmets. Sure, the models most mainstream shops stock have an adjustable fit dial in the back, but the helmets themselves are quite large on my 1yo son, and protrude enough in the back that trailer riding becomes an exercise in frustration, with the helmet getting pushed down onto his face. Enter the Lazer infant helmet ($25), via Longleaf Bicycles. It fits heads as small as 46cm, doesn't look horrible, and was easy to adjust. Luc and I liked it, and were so sad that it got lost in the great Amtrak cargo bike debacle of 2010. Now he's stuck with some pink Strawberry Shortcake sister hand-me-down. 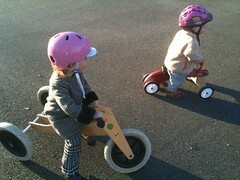 Bern helmets are the Totcycle family favorite. Mom, dad, and daughter are currently sporting lovely Bern helmets with built-in fabric visors. Poor visor-less & emasculated son. A new helmet would probably be cheaper than all that therapy he'll need. Bern helmets are sleek, light, comfortable, have excellent coverage, and are refreshingly lacking in extraneous vents for vents sake. Why look like a roadie if you don't have to? They come in summer and winter versions (warm earflaps), many have removable visors, and the colors & shapes are appealing. Drew LOVES her pink Bern helmet, and likes that she has the same helmet as mom and dad. And that Luc doesn't. Giro helmets are the ones you're most likely to find at your Local Bike Shop. They're cute, and work well for toddlers and preschoolers. Here one is looking a bit big on Luc. The adjustable fit dial is handy, but please note that it only connects by velcro to the "money" part of the helmet, so it will not hold the helmet in place in any sort of "why we wear helmets" scenario. Make sure the straps are properly adjusted (see below, not my beret-style photo to the left). These multisport helmets from our bikey neighbors to the south win on graphic appeal, and have a more durable shell, for older kids that like to skateboard or throw their helmets around. They are heavier and look a bit bulbous, IMHO. But if they fit your kid's head, and the durability/weight tradeoff makes sense, or they love the graphics, go nutty with these. I'm going to bypass any helmet debate here and just assume that if you're putting a helmet on your child then you're doing so wanting it to be effective, rather than to satisfy the letter of the local law. If so, please please please snug up those straps! There are SO many kids out there with dangling helmet straps. That leaves the helmet next-to-useless in a crash, where it will slip off the part of the body you're hoping to protect, and possibly harmful, if the helmet were to catch on something and get pulled behind your child's head. Before adjusting the straps, make sure the helmet fits - ideally you should be able to adjust the snugness so it doesn't fall off with straps unbuckled. Next, get the angle right - the front of the helmet should be low on the forehead, not jauntily at the hairline or down in their eyes. Your child should see the brim of the helmet when he/she looks up with their eyes. The straps should be even, and each make a "V" with the bottoms just below their ears. Finally, and this is the hard part, snug up the straps so that only 1-2 fingers can fit, and so that your child can feel the straps tighten when opening their mouth fully. That last part is hard for kids with sensory issues, who are resistant to helmets in general, who are used to loose straps, or who have been pinched in the past. Oh, the guilt I have about the times I've pinched Drew buckling her helmet. She won't let me forget it. Be very cautious when buckling, have them look up and close their mouth, and use your own finger as a "pinchguard". Then gradually snug up the straps a bit more with each ride. Need a quick 1-2-3 helmet fit test? Just remember the eyes, ears, and mouth part. When it's cold out, the models with ear flaps are great, but you can also use a hoodie top or thin wool cap to keep little heads and ears warm. Bulky hats and hoods interfere with helmet fit, though. In the category of "safety advice based on ultra-rare occurences", the safety people would like me to warn you that bike helmets are not for general play, especially on playground equipment, where a handful of children have snagged their helmet dropping through narrow spaces. Starting young, letting your child help pick the helmet, modeling helmet wearing yourself, and being consistent about their usage may reduce helmet battles. In your house, that is, not online. What helmets have worked for you and yours? Any tips on getting them on kids, fitting them, and avoiding the dreaded "pinch"? We use the Trek Little Dipper for our one year old. Starts at 47 cm, and she has a pretty generous head circumference so it works well for us. Best part is the pinch guard! I can get it snug every time with no worries about a traumatic helmeting experience! 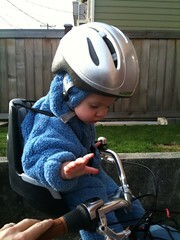 just got a Giro helmet for our youngest (11 mths). it's called The Spree and it fits 46cm-50cm. our 3 yr old has a Bern. you're right: it's a great helmet. he loves it. This is a timely guide for us, as we have to replace our daughter's Giro helmet NOW-- the plastic structure is "attached" by a tube of fabric, which split at the (glued) seam. Once that went, the helmet was no longer wearable. Sad! It's the one with cute chicks on it and everything! I'll know better what to look for this time, and probably seek out a Bern. i got a nutcase ahead of time, and since i was nervous about him being OK with wearing it, I had it out with his toys so he could play with it for a couple weeks before I had my bike set up to start riding with him (at 9 months, started using the ibert, it's great). He is totally cool with the helmet now, and wasn't when I first bought it. Thanks for the timely reminders and suggestions. We're feeling frustration with the Giro helmet here and looking for a better small helmet as our youngest approaches a year (which is when he'll start on the bike). This was just what I was looking for. Good tips, y'all! I'll check out that Spree for Luc ... as for "blessing" the use of the hoodie, it's probably officially discouraged, like bulky clothes/coats in car seats, but it seems to us that the helmet appears to meet reasonable fit/snugness criteria with a thin hood and properly adjusted straps. Although my kids are way beyond this age, I so appreciate your providing this helpful info and will share it with friends. Thanks! More great information as usual! We got the Little Nutty for our Little Muffin (13 months old now) and she is swimming in it. I like the style and function of the Nutcase but looks like we'll have to go with something else for a year or two until she fits it... though I'm not sure anything will fit her tiny head. We have the XS and it says that is 46cm, which is what you say the Lazer fits as well. Do you think the Lazer will fit a smaller head than the Nutcase? Hi Shane - Can't say for sure as we didn't try a Lil' Nutty on Luc, but the Lazer was smaller than anything we'd tried, and fit him at 10mo. Anthony at Longleaf Bicycles might have a more valid comparison, or maybe one of your local shops can order some in. UPDATE: Tried a Lil' Nutty on Luc yesterday - HUGE. The Lazer was a better fit, fer sure. Ah, this is great! So far I've been doing Dexter in the trailer sans helmet. The laws aren't very specific. One states you have to have a 5 point harness. Done. If he's in the trailer I figure he's not riding ON the bike so he doesn't have to wear the helmet. And you're right, the one he has doesn't fit. I got the smallest one possible from Louis Garneau and it's uh... huge. Do you think a 1 yo could handle sitting up in the Madsen? As long as Dexter had a helmet and didn't squirm out of the seatbelt I think it would be okay? But maybe still too soon. Dexter's looking mighty cute these days. I think a Bobike Mini or one of the new GMG Yepp seats would be ideal for him. You'll really like the "10 MPH hug" aspects of front riding. On the MADSEN, there's no knee interference with those seats, but you do need to wriggle in and out of your saddle a bit. Practice without him, and you'll get it down (making your move with the bars slightly turned helps). I haven't yet felt comfortable putting Luc back on the MADSEN bench. The seatbelts we have a a little slippery, and tend to work loose. Plus he's a little escape artist. Maybe when he's more like 20mo. But I am thinking about a different "down low in the bucket" seat for him now.